ysabetwordsmith | Poem: "Nancy Stories"
This poem came out of the August 5, 2014 Poetry Fishbowl. It was inspired by a prompt from LJ user Rhodielady_47. It also fills "the mind's eye" square of my 7-30-14 card for the genprompt_bingo fest. This poem has been sponsored by chanter_greenie, Anthony and Shirley Barrette. It belongs to the Polychrome Heroics series. Note: This poem is written in dialect using references for Grenadian Creole English. The unfamiliar grammar, spelling, and vocabulary are not mistakes but rather follow rules different than those of mainland American English. about a dead man makin' trouble. a cat all swole up from a spider-bite once. draggin' people in de bush. "I go check it out," I promise. all hung up in branches. dey have in de movies. with de same scales and paddy feet. "Eh Fwere!" I yell, jumpin' back. lickin' his orange eyes one at a time. hides him real good against de tree bark. "We did not come here to harm anyone. to the stories that your people tell." because dat ship dented up in front. "You are much larger than we are,"
we will repay you handsomely. and deserve better tools anyway." "I help yu fuh freeness." and pry hard, only dat ship stuck but good. "Ka dammit fut!" I say, yankin' again. "Gwan now, fuh somebody see yu,"
I say, waving a hand at de sky. "Thank you for your help, hanifa,"
smack on my left hand. and I wonder if I go drop dead. his dreads swingin' as he leans toward me. "We foot," I say in disgust. done wreck dey ship in a nutmeg tree. so my hand feel like it go fall off!" but it don't go 'way or even go down. grinnin' and slappin' his knee. "Ain't nobody talk nancy like yu, Uel." like shakin' pollen from a flower. straight outta my mind's eye into air. and everything turn ol' mas' den. looking fuh truth and findin' story all de way. Hanifa (Uel Forteau) -- He is a young man with black hair, brown eyes, and brown skin. He is the older brother of Nadisha Forteau, working on a nutmeg farm owned by Skateordie's father. Originally from Grenada, he grew up speaking Grenadian Creole English. His English is good, and he's learning both French and Spanish as he travels around the Caribbean. Hanifa means "searcher after truth" and that's what he does now, because he doesn't really fit into his old life anymore. The nanites that the "stickin' lizard" aliens gave him can do almost anything he can imagine, so they qualify as a meta-power. The easiest thing they do is illustrate stories that he tells, rather like a hologram. They can do many other things, such as healing or transformation or levitation, but that requires a higher level of mental focus and practice so there's a limit to what he can accomplish so far. Origin: He told tall tales, and helped some aliens, so they gave him nanites that can illustrate his thoughts or make things happen. Motivation: Looking for truth and finding stories. Nadisha Forteau -- She has long black hair, brown eyes, and brown skin. She is the younger sister of Hanifa (Uel Forteau), working on a nutmeg farm owned by Skateordie's father. She lives in Grenada and speaks Grenadian Creole English. Skateordie -- He has black hair in dreadlocks, black skin, and brown eyes. He is a friend of Uel and Nadisha Forteau. Skateordie's father owns the nutmeg farm where they all work. Grenadian Creole English is spoken by many people in Grenada. back of yonder (refers to an area over the village of Windward in Carriacou. Near St. Hillaire (St. ‘laire) (accent the last syllable). Nutmeg farming usually looks like a jungle because these are understory trees that like shade from taller trees. another. “Have a next one.” Have another. a kind of evil spirit that takes people and drags them in the bushes. what most of the population cooked on. Looks like a Japanese hibachi. Ever since Roswell, crashed spaceships have been a trope. Things that come from the sky can bring advanced alien technology. same as wood slave (lizard with padded suction cups on its feet); gecko. 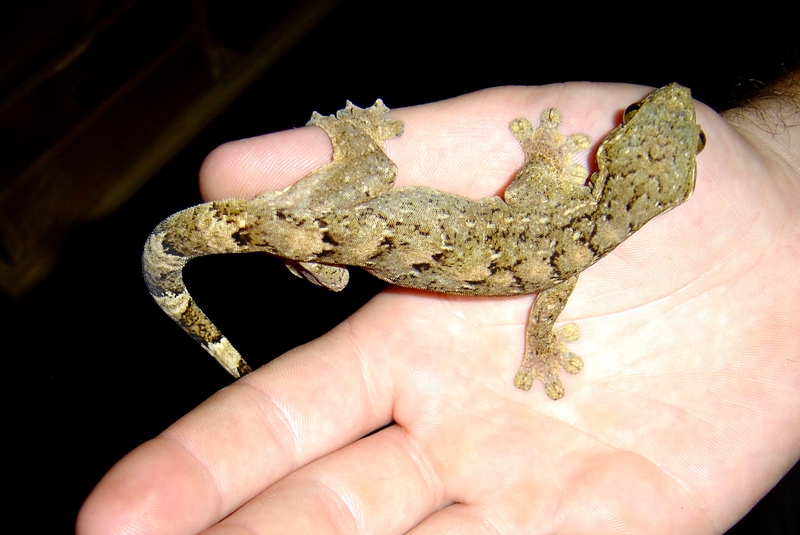 The turnip-tailed gecko lives in Grenada. They're cute little lizards. The machete is an all-purpose tool in tropical cultures, built sturdy enough for many different tasks. skin sore; sore foot; badder than anything else; figuratively a high compliment – “Bwhy, I had a lawyer for she arse; ‘e bad as bobo and ‘e hard as grugru…Huh, e go give ha cat piece and pepper.” (pronounced boh’ boh). Nanotechnology consists of tiny programmable machines, often appearing in entertainment. Controlling them can convey superpowers of various kinds. I'm glad that you enjoyed this so much. The etymology I've seen for "duppy" (which appears in several creoles, including Haitian) is a dialectal pronunciation of the Hebrew "dybbuk", meaning devil -- probably from all the Yiddish speakers migrating worldwide during/after World War 2. "Duppy" seems to cover every kind of evil spirit from malicious ghosts to devils, although it typically sticks to noncorporeal spooks rather than material monsters. Neat! I was wondering where "duppy" came from, since I have heard stories about the "duppy trees" in Jamaica. :) I have the warm fuzzies. I like this! It kind of figures, given previous conversations, that I'd pick a Caribbean story without realizing it, doesn't it? No objections here! I'm so glad this worked for you. It's kind of a life-tipping experience for Uel, but on the whole a positive one. Just goes to show that you never know how a good deed will pan out for you. I love the different language, and it was easy to parse without looking up the glossary terms. Re: Better than Television, again. Yay! I wasn't sure how easy it would be for other people to read and understand. I'm glad it came through clearly. I like telling stories from different perspectives, different cultures. Most of the alien encounter stories are very American-centered. But the rest of the planet is a lot bigger. Came through pretty well for me, too. But then, I didn't have any trouble reading Chaucer in the original Middle English back in college. Yeah, I'm that way too. One of my English teachers had studied Old English so she read a sample and then passed the rest of it around for the class to read. I was the first person in the row. I took the book, read the next section exactly as she had, and held the book over my shoulder. From behind me came a tiny voice, "I have to follow that?" Yeah, I liked him, so I felt kind of bad for him. I'd forgotten not everyone could just do that. But it was par for the course at Uni, we were all geeklings and did that to each other all the time. So we learned to cope and not take it too personally. Me likes much! (Not trying to talk Grenadian, just a thingie of mine.) As you might expect, I especially enjoyed the creole. Funny how words like Gwan, also turn up in Yorkshire dialect. I suspect one of the contributors to the linguistic stew might've been from around here. It's interesting that some of these words are island-specific and some are dispersed throughout the Caribbean. I recognized "Nancy stories"...my husband said "Anansi stories." Not sure whether this was because he grew up on Trinidad rather than Grenada, or because he'd been in North America for a long time. dialecticdreamer - Better than Television, again.